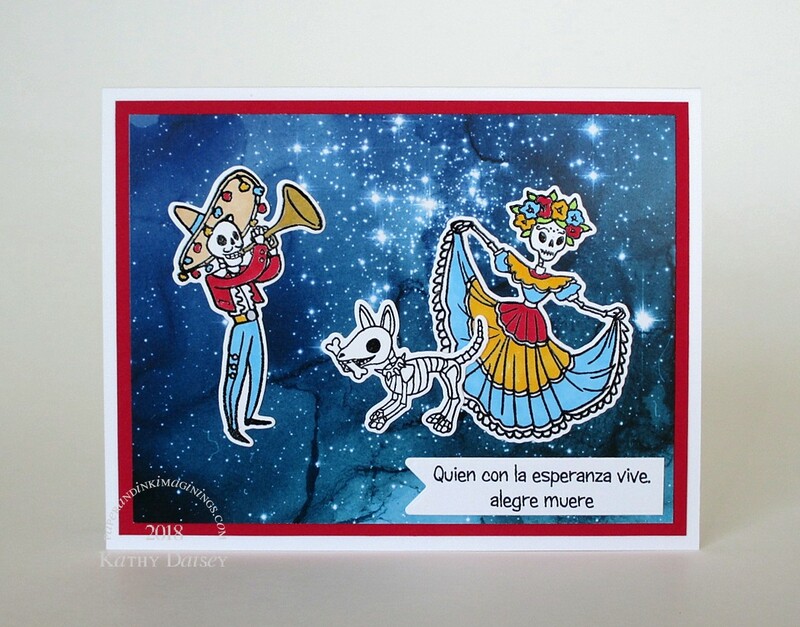 Dia de los Muertos 2018. I thought the watercolor galaxy paper from Brutus Monroe was a perfect backdrop. The sentiment was printed from my computer. The translation is: Whoever lives with hope, dies in peace. Supplies: Stamps – Hero Arts, paper – Brutus Monroe Watercolor Galaxy, Neenah Classic Crest Solar White, Stampin’ Up! Real Red, inks – Copic B02, C3, E53, R29, YG23, Y17, Y26, Y28, VersaFine Onyx Black, dies – Hero Arts (characters), Simon Says Stamp (banner), embossing powder – Stampendous Detail clear. Categories: card, holiday | Tags: Brutus Monroe, card, Copics, Hero Arts, Neenah, Simon Says Stamp, Stampendous, Stampin' Up!, Tsukineko, VersaFine | Permalink.